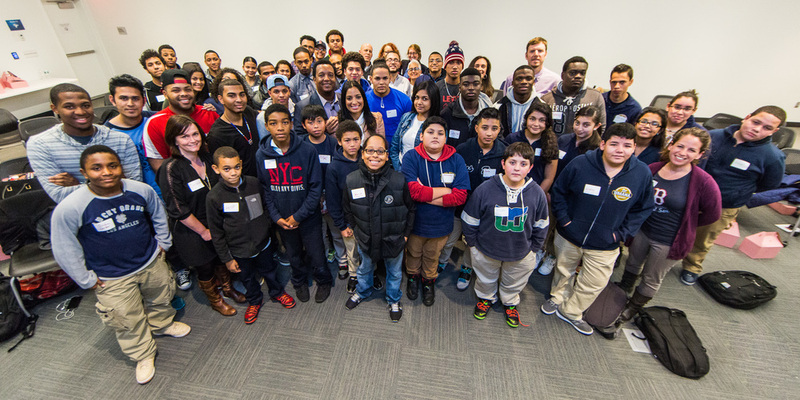 On January 5, St. Stephen’s Youth Programs hosted its annual winter alumni gathering. The event has two goals: to create a space for graduates of SSYP who have gone off to college or careers to reconnect with each other and to offer those graduates continuing support as they take these next steps in their lives. The event has also become a time for our current teens, the Counselors-in-Training and Organizers working for SSYP, to meet and learn from our alums. Last year, the winter event included a panel of graduates who talked about their experiences following high school and alumni shared advice with teens about how to overcome a variety of obstacles. This year, the event had three different parts; all were designed to provide teens and alumni with resources of support toward long-term success. First, our currently employed teen staff met with Gabe Baldwin, a teacher of mindfulness techniques. This was the initial session in a series of workshops promoting mindfulness, emotional regulation, and active listening. Through this series, teens will build the skills to take care of themselves as they navigate the challenges that present themselves in both high school and beyond. At the same time teens were practicing mindfulness, graduates were talking about the growing alumni program SSYP is rolling out this spring. In addition to ongoing support for FAFSA renewals, college transfer applications, and scholarship forms, SSYP is launching a new professional networking program. This network will help connect our alumni with people who are working in the fields our graduates are interested in pursuing. Following this announcement, alumni talked with each other, sharing stories and resources. It was wonderful to hear young adults speaking about their successes in a wide range of experiences and offering strategies and tips for overcoming the challenges they have faced. They learned from one another and gave feedback to SSYP about additional ways we might offer support. Then, the teens and alum joined together, forming small groups to foster discussions of the hopes for and fears about life after twelfth grade. It was moving to witness the openness of both groups: the teens were willing to learn and alumni were sharing their experiences with honesty and wisdom. The event reaffirmed how committed our teens and alums are to SSYP and each other. There was that deep feeling of community and family that is so often mentioned as a key quality of SSYP. We look forward to seeing what develops next! SSYP is recruiting current professionals from different fields to be part of that support network for alum. If you are willing to meet with students during the spring to talk about your job and answer questions, please contact Jeremy at jeremy@ssypboston.org. Career exploration remains a cornerstone of the College and Career Program here at St. Stephen’s. The goal of this program is to expose teens to the variety of different pathways out there, as well as provide space for them to think critically about what they are passionate about. One way we do this is through Career Panels, where volunteers from a variety of different fields come in and talk with teens about their own educational and professional journeys. This fall we have held two different career panels, one focusing on the health field and one on social justice. During the health panel, students learned about public health opportunities, what it takes to become a veterinarian, and the different career opportunities within the mental health and counseling fields. Panelists talked about their own educational journeys, and what inspired them to pursue their own path. Teens asked questions and networked with the panel, and walked away with a broader sense of what it means to pursue a career in the health field. During the social justice panel, students were exposed to careers in labor organizing, community organizing, environmental justice, criminal justice, higher education, and community health fields. Panelists were asked to define what social justice means to them, and then talk about how it relates to their work. Teens then split up into smaller groups where panelists led a discussion on how social justice has been a motivating factor in their own lives. Both panelists and students walked away from it inspired by having the chance to talk with one another, and motivated to continuing to do social justice work in our communities. This spring we will have three additional panels. On January 19th, we will have a panel on Education, on February 26th we will focus on STEM careers, and finally on April 27th we will spotlight the trades and alternative careers. If you are interested in being on a panel please reach out to Jeremy Kazanjian-Amory, Sr. Manager of College Access & Success at jeremy@ssypboston.org. There are moments when the only way individuals can get through tragedy and loss is by banding together as one community. Last week, St. Stephen’s Youth Programs (SSYP) suffered an immense tragedy with the loss of one of our teens who died suddenly and unexpectedly. This was then followed up by the election of Donald Trump, the culmination of a contentious, often hate-filled campaign season. These events brought a host of complex emotions for both staff and teens, as we all tried to navigate the variety of different feelings we were experiencing. Grief, anger, frustration, fear, and a certain numbness to what was happening within our immediate community and more broadly within the country at large gripped us all. However, as is often the case, we found that it was incredibly important to turn toward each other and unite as a community to help us get through this time. On Thursday, November 10th, all thirty-two teens and the entire adult staff of the Teen Programs sat together in a community circle to reflect on the week. Led by our long-time social worker Rebecca Garcia, the group was able to use the restorative justice model of healing circles to create a safe space to share what we were all going through. Students and staff talked about the grief they were experiencing. We shared the fear and uncertainty we felt with the outcome of the election. Teens talked about how they were afraid for their families and didn’t know if some family members were going to be allowed to stay in the country. They talked about the sadness they felt surrounding the loss of a community member. Students expressed an anger toward a country that had elected a president who has routinely spouted hatred towards people just like them. And yet, out of the circle came a strong sense of love and hope for the SSYP community. Students and staff held each other as they cried, and all of us were able to know that we were in a place and a group that would always be supportive. Teens expressed a deep love for both the St. Stephen’s community and each other. They were able to find strength in one another, knowing that they were surrounded by people who loved them and who would be there for them no matter what these next four years (and beyond) bring. Over the past week, it has been easy to be overcome with sense of hopelessness around the state of the society and democracy. However, one thing that became clear last week was that there is hope for and in our community. The strength and resilience that our young people demonstrate on a daily basis should be proof that we will be able to rise above the hatred that we see on the television news. Instead, we can replace it for a love of one another, knowing that together we have immense strength. I personally walked away from the meeting last Thursday with a deep sense of gratitude for the strong community that has been built here. I know that SSYP will continue to fight so that our young people have the opportunity to pursue their own dreams in this world. Students engage in interview practice. For the past twenty years, the college access programs all over Boston have focused their energy primarily on getting students into college. Energy and resources have been dedicated towards helping low-income and first generation students overcome the variety of obstacles that exist during the college admissions process. However, as the effectiveness of these programs increased, a new problem presented itself that had a dramatic effect on students all over the city; college completion. While students were getting into college at increasing rates, they were also dropping out of college without any degree and amassing tremendous debt. In many ways, students were worse off then they were before going. CITs participate in a college prep workshop focusing on planning the future. St. Stephen’s has been witnessing this firsthand, having watched several alumni over the years drop out of college saddled with debt because of a missed payment, a failed class, or a lack of support from the institution of higher education. The new vision of the College and Career Program at St. Stephen’s is to empower students to think through their future goals, and support their development of a post-high school plan. By changing the narrative that 4 year college is the only measure of success, we are able to help match students with a post-high school plan that best fits their personal goals, to help ensure long term success. Teens, Specialists, Site Assistants and Site Directors participate in a resume workshop. 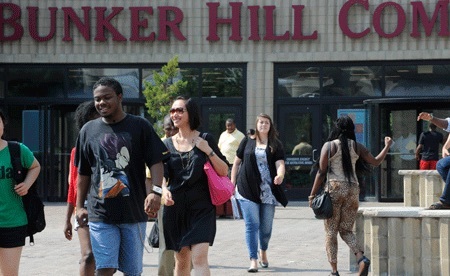 Our goal is to not only support students through the college application process, but also to partner with schools like Bunker Hill, Wheelock, Northeastern, Pine Manor, Benjamin Franklin, and many more, to help ensure that students are supported throughout their entire post-high school experience. In addition, St. Stephen’s is hoping to continue to increase the ways in which we support our alumni through academic tutoring, mentoring, college visits, and much more. It is imperative that St. Stephen’s continue to provide the resources necessary in order to help our alumni overcome the vast number of obstacles that higher educations presents, in order to ensure that they are on a path towards successful adulthood. If you are interested in getting more involved in this program, you can e-mail Jeremy at Jeremy@ststephensbos.org. Jeremy graduated from Colorado College with a Degree in Political Science and Urban Studies in 2012. He comes to St. Stephen's through the Massachusetts Promise Fellowship program, an AmeriCorps program that focused fulfilling the needs of our youth by providing: a caring adult, a safe place, a healthy start, a marketable skill, and an opportunity to give back. Jeremy is passionate about increasing low-income students' access to higher education and helping students successfully complete their post-highschool plans. He currently serves as the College and Career Program Coordinator during the school year, and a Teen Staff Coordinator over the summer. The streets of Boston are bombarded with purple-shirt-wearing teenagers as 160 of them make their way to work. Our highest youth employment numbers ever come through our partnerships with the Department of Youth Employment and Engagement, ABCD, the Attorney General's Office, the Chelsea Collaborative, and St. Stephen's Youth Programs funding. Not only do the 160 teens participate in a fun, active and safe place to work but are also provided with 20+ hours of professional development and job training. This week, the teens learned about the effects of trauma on young people and the deep need to use the 8-Steps, the B-SAFE way of behavioral management, in order for children to feel safe, big and connected. In the training portion of the week the teens had to opportunity to learn about the Cycle of Socialization and reflect on their self identity. ebecca Jackson training the teen group at Church of the Holy Spirit. By Kasey Boston, Director of Youth Employment and Leadership. Kasey is in her 4th summer with B-SAFE and joined our team after completing her masters degree in International Education Policy at the Harvard Graduate School of Education. Kasey works with St. Stephen's Youth Programs year round and focuses on building professional development and life skills with teens. Kasey works to create service-learning opportunities for all young people and hopes to begin traveling abroad with teens this year. Last Thursday night at the Villa Victoria Center for the Arts, St. Stephen's Youth Programs brought over 130 people together to celebrate our 31 seniors on their successful high school graduation. We enjoyed a night of tasty food, getting to know each other, listening, and learning with our fantastic St. Stephen's seniors! Featured speakers included State Representative Byron Rushing; Student Speakers Tahnaree Evans and Alex Maizonett; Mentor Blake Sims; Alumni Speaker Pedro Cardoso; and SSYP Staff Tim Crellin, Liz Steinhauser, Kasey Boston and Jeremy Kazanjian-Amory. The event included a gallery of gorgeous senior portraits taken by former SSYP staffer Meg McDermott and featured on our Facebook page. We hope you'll plan to join us for next year's Reach Beyond in May 2017! If you'd like to learn more, sponsor Reach Beyond 2017, or be a mentor to one of our teens, please contact Jeremy Kazanjian-Amory at jeremy@ststephensbos.org. 100% of St. Stephen's seniors graduated from high school. For young people in the neighborhoods we serve, earning a high school diploma is a huge hurdle. Last year, for a second year in a row, all nineteen of our seniors graduated from high school. That was amazing, given the fact that only about a third of their public school peers who enter high school achieve that goal. Their success reflects a lot of hard work on their part and a lot of support from us — one-on-one mentoring, academic enrichment, and college counseling. They all headed off with great plans for this fall. For some time, we have known that getting into college is only the first hurdle. As we hear from from our alumni, making it through college is very difficult for young people who graduate from Boston Public Schools (BPS). In fact, The Boston Foundation reported that college completion rates among BPS graduates are almost as low as the district’s high school graduation rates. Some teens experience “summer melt” and drop out before they actually enroll in college. Others become discouraged early on when faced with remedial coursework, overwhelming debt, and lack of support. Sometimes, students who are used to being portrayed as “success stories” in their communities drop out without telling anyone they are experiencing difficulty, embarrassed about not being able to meet the goals they have set for themselves. The Success Boston College Completion Initiative was created to change the conversation from college access to college success. Based on their model, this year our mentoring program will include college students and we are developing an alumni support program to connect students with other SSYP alums, and campus resources. If you are interested in being involved in this program please contact Jeremy Kazanjian-Amory. Over the past week, through a partnership with Mass Mentoring, teens from St. Stephen’s have enjoyed a variety of Boston sports events. This past weekend, soccer fans Aliyah Glover and Nyah Webb traveled to Foxborough see the New England Revolution play the Montreal Impact at Gillette stadium. They went with their mentor, Kali Downer, as well as St. Stephen’s staff Kasey Boston and Jeremy Kazanjian-Amory. It started snowing in the second half, but the group stayed warm with a steady stream of hot chocolate and warm treats. Despite the Revolution losing 1-0, the group loved the experience and was thankful to have had the opportunity to go on the adventure together. All of these experiences were made possible through the partnerships between St. Stephen’s, Mass Mentoring, and Celtics Shamrock Foundation. With this partnership intact, St. Stephen’s hopes to continue to send teens and their mentors to games throughout the rest of the year. On November 22nd, eight students from St. Stephen’s Youth Programs and St. Mary’s Ethiopian Congregation ventured out on the commuter rail to visit Wellesley College. The trip was part of a growing partnership between St. Stephen’s and Wellesley, which also includes SAT Prep, a program in which Wellesley students help prepare high school juniors at St. Stephen’s for the SAT exams. This fall, the partnership grew to include a program for seniors focused on college preparation. The high school students set up Common Applications, wrote college essays, and participated in SAT Prep classes. The opportunity to visit Wellesley College allowed students at St. Stephen’s to see what a small liberal arts college looks like and ask the college students questions about their experiences and challenges. The visit included a tour led by college students and a panel of college students who answered questions. Helegenat, one of the students from St. Mary’s commented that her favorite part was “talking and listening to the Wellesley students, especially hearing the first generation student’s stories and advice. Also viewing the art room was something that struck my interest because it pertains to the type of art I’m working on right now.” After the panel, everyone went to the dining hall and stuffed themselves at the buffet. The next stop was the student center, where Wellesley generously provided $10 for every student at the gift shop. The students left the school fulfilled by a fun day exploring a new part of Massachusetts and learning about a different type of school. St. Stephen’s is excited to continue the partnership with Wellesley in the spring by providing SAT Prep for Juniors. If you know anyone who may be interested in participating or if you want to learn more about how you can be involved in the College and Career program at St. Stephen’s, please reach out to Jeremy.